A roundabout is a type of intersection that allows two roads to merge together to form a circular lane instead of a T-shaped crossing. Roundabouts are considered safer than normal intersections because they force cars to slow down and reduce the chances of a high-speed collision. Some cities have more roundabouts than others, but no matter where you live, you are sure to come across one eventually. For this reason, it’s a good idea to learn how to navigate both single-lane and multi-lane roundabouts. A single-lane roundabout is very simple to navigate. As you approach the intersection, slow down and look for pedestrians and cyclists as you would in a normal intersection. When you see everything is clear, enter the circular road and follow it to the right, yielding to the cars that are already in the roundabout. From there, simply follow the circle until you get to the side that exits onto the road you’d like to take. Use your turn signal, continue to watch for pedestrians and then carefully make your turn. If you miss your turn or there is a pedestrian blocking the crosswalk when you arrive, simply continue around the roundabout and try again. Never stop and wait while in the roundabout as this could cause an accident. Bigger cities often have multi-lane roundabouts, which can be a bit more intimidating for new drivers. Luckily, these scary-looking intersections aren’t actually as difficult to navigate as they seem. As you approach the roundabout, you will see a sign that indicates multiple lanes. Similar to a normal intersection, you must choose your lane before entering the roundabout. If you plan on making a right, get in the right lane. If you plan on continuing straight, stay in the center or right lane. If you plan on continuing all the way around and making a left, get in the left lane. From there, simply yield to traffic and pedestrians and follow the roundabout the same way you would in a single-lane intersection. Many new drivers are intimidated by entering a roundabout when there are large vehicles in the rotation. You will probably find that this is especially true if you come across a vehicle that is towing an extremely wide load. Certain roundabouts are built with an extra section of pavement that is designed to accommodate these wide-load vehicles, but sometimes, the vehicle must take up more than one lane. For this reason, it’s never a good idea to merge in alongside a large vehicle even if there appears to be room. Instead, wait for the vehicle to pass and then merge in behind it. 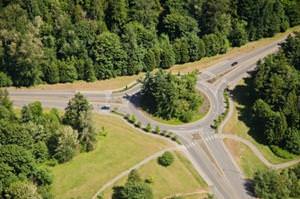 Roundabouts operate similarly to T-shaped intersections when it comes to lane choices. Always yield to the drivers who are already in the roundabout. Do not change lanes within the roundabout. If you get in the wrong lane, exit the roundabout, make a U-turn where it’s safe to do so, and re-enter the roundabout in the correct lane. Don’t stop in the roundabout as this could cause an accident. If you have car trouble within the roundabout, do your best to continue rolling along toward the next exit and then pull over once you are back on the normal road. Avoid merging in next to large vehicles. Merge behind them instead. Watch carefully for pedestrians and cyclists just like you would in a normal intersection.